In order to originate IP routes, each PE device is configured with L3 VRF, IRB interface and static route pointing to directly attached CE. CE devices are configured with static default routes pointing to the closest PE. 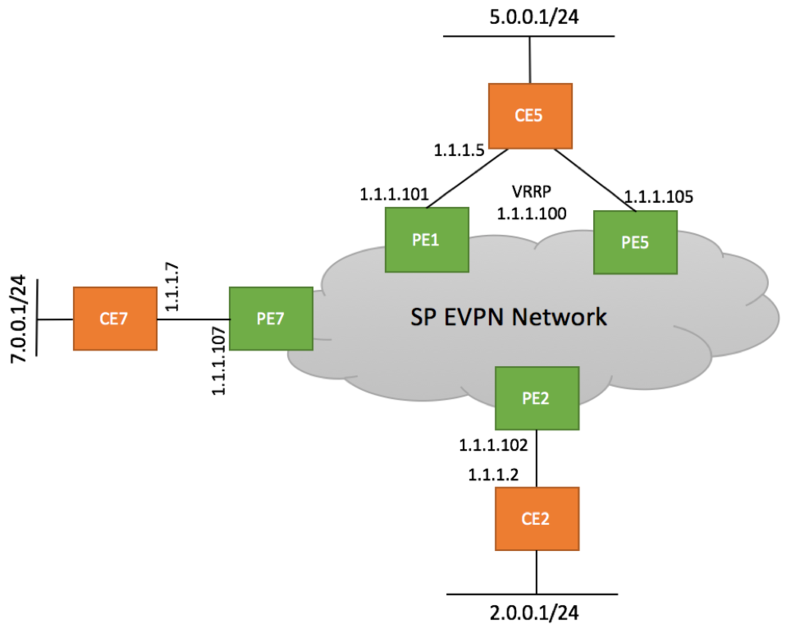 Please note that EVPN allows to use shared gateway across all PE devices, instead of configuring unique IPs on each PE. We will cover this scenario in one of the next articles. We will use site 2 for our examples. PE2’s configuration is shown below. If we look a little dipper into advertised routes originated by PE2, we will notice that three labels are associated with our EVPN instance – Label 16 to handle L3 traffic, Label 299,776 to handle L2 traffic and Label 299,840 to deliver BUM traffic to the EVPN instance. Looking into ‘2.0.0.0/24’ on PE7 reveals that two labels are being pushed by the router – top label 800,202 to deliver frames to PE2 and bottom label 16 to signify the routing instance. You can download EVPN L2 and L3 Dataplane Packet Captures.